Cell phone use is now the most commonly used apparatus of all electronic devices and has surpassed standard desktop and laptop use by most people. Cell phone vision syndrome is a subset vision disorder that is like the conditions associated with laptop or desktop use.The symptoms that may arise from cell phone use may be equally as or in some people, more profound than with desktop or laptops, including an increase in frequency and intensity discomfort. The problems that develop may also include that of muscle-skeletal strain and restrictions in mobility of the neck and back as well as headaches. Squinting at computer, tablet, or mobile screens for hours at a time is a normal part of our lives in the 21st century. 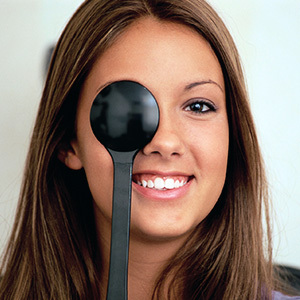 Unfortunately, eye problems associated with this activity are also on the rise. Even if you have never had eye problems before, you may have noticed computer vision syndrome symptoms after two or more hours of screen time. Even if your symptoms are mild, they can worsen and cause other vision problems if not addressed. Dr. Wexler, can help. Eye fusion abilities- Tests how well the eyes see depth perception and sustains keeping the eyes working together as a team under stressful conditions. Phoria and Reserve- Tests how your eye prefer to be aligned at near and far and measure your ability to sustain your eye's proper posture over time. Dr. Wexler recommends the following to help you with some of the eye problems you may be facing. Keep in mind a full eye exam specifically tailored to your near vision problems is vital in diagnosing potential hidden vision disorders. With the proper diagnoses, the best treatment plans can be discussed with you. Computer setup—Adjust your monitor so that it is about 20 degrees lower than your eye level when seated between 20-28 inches away from the screen. Reference materials can be placed on a document holder between the monitor and keyboard, or to the side, but positioned for as little head movement as possible. Also invest in an anti-glare screen for your monitor to help reduce glare from surrounding lights. Be sure to sit and work with proper posture. Adjust Lighting—If you can, reposition any lighting (or your computer) to minimize glare and use natural lighting whenever possible. You want neither overwhelming light or a room that is too dark. Avoid glare situations like using the phone in sun or bright light conditions. Eye Rest and Blinking Breaks—Every 20 minutes during your work, look away at least 20 feet for a minimum of 20 seconds to refocus your eyes, and give them a 15-minute break after each 2-hour computer session. Remember to blink more frequently to keep your eyes moist. Reduce time with phone by taking interval breaks. Look away from the cell phone every 5 minutes. Increase font size of the letters. Keep the phone’s face window clean. Get a thorough assessment for dry eye syndrome, a very common eye problem. Get examined for uncorrected or under corrected eye prescriptions. Keep head erect and level. Hold cell phone perpendicular to face at no closer than 16 inches. Use voice activated typing rather than only thumb or fingertip typing. Limit the time spent on the computer or cell phone. With a combination of the proper professional eye care and self-care, you can minimize computer eye syndrome and other modern-day vision problems. Contact us for an appointment today.